"Wow I never thought it was all about the dress but I guess when it is a Melanie Ford design it is all about the dress. On returning from our honeymoon six weeks later our guests were still talking about THAT AMAZING DRESS! I enjoyed every minute of the experience including creating the concept design to the appointments in the lead up all made very easy with your gentle guidance and attention to detail and finally wearing my beautiful gown on our special day. From the moment it put it on I felt amazing and to this day 2 months later it still hangs at the end of the hall because I can't bear to put it away. 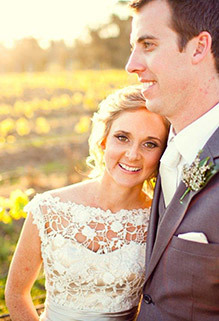 Melanie you truly are amazing and I can't thank you enough for my wedding dress, a dress which I will treasure forever."